It is made from 8,829 tiles in 42 colours, with a nominal size of 892mm wide x 1200mm high (approx 35 x 47 inches). Packing and Delivery to most of the UK is included in the price, with no VAT to pay. 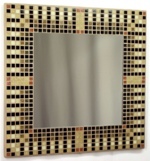 This mosaic design can also be shipped to Europe, USA, Canada, Australia and other countries. To order this mosaic or get a price for your location/currency, please add to your shopping basket where you can get a live quote and place your order (see the Delivery and Prices section below for details). 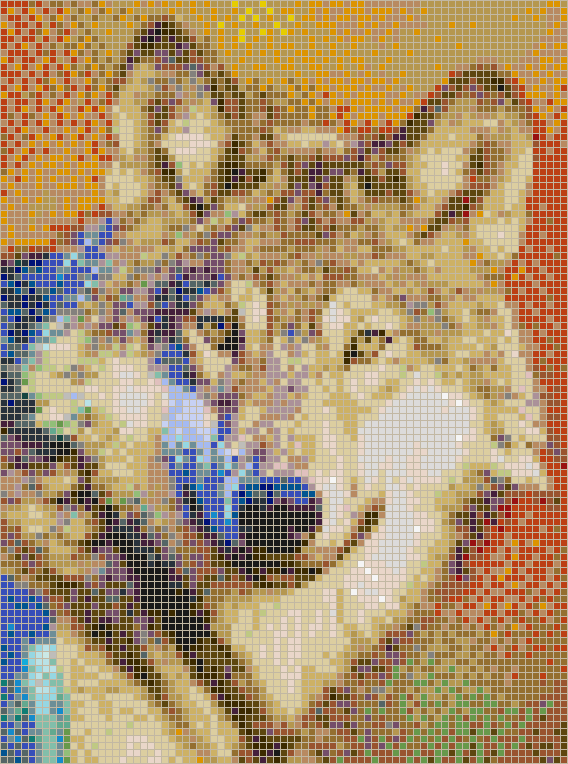 This mosaic design is Copyright © 2011 Kaamar Ltd, based on an original photograph gray wolf by wpclipart.com under Public Domain licence. No of Tiles: 8,829 tiles (81 wide x 109 high) in 42 colours. 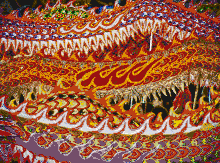 Mosaic Size: 892mm x 1200mm nominal (approx 35 x 47 inches). Mosaic Area: 1.070 square metres nominal. No of Sheets: 6 full sheets, 6 partial sheets. Grout Colour: Grout not supplied, you can choose colour. 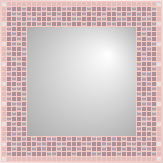 Our Mosaic Tile Art is prepared using the "Reverse Double Direct" method, a variation of the "Double Indirect" method, where tiles are first laid out in the design and attached by their top face to a removable transparent film, which is labelled to show the orientation and the position of the tile sheet in the mosaic design. A permanent high strength mesh is then applied, as an extra security holding the design together in transit, using waterproof adhesive to the underside of the tiles. The sheets can then be pressed, mesh down, into the tile adhesive, transferring chunks of the design in one go, maintaining the tile layout. Once the tile adhesive is set, the transparent film sheets can be easily peeled from the tiles. With the film removed, the tiles can now be grouted to complete the mosaic. A good quality White, flexible, waterproof tile adhesive, suitable for small vitreous glass tiles is recommended. Grout should be suitable for small grout lines between vitreous glass tiles, anti-mould, waterproof and flexible, in the colour of your choice. Light-medium grey is most common, providing a neutral background for tiles of many colours, however there are a wide range of colour grouts available. 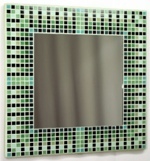 The grout colour can be chosen to lighten or darken the overall mosaic, to contrast or colourise the tone of the mosaic. Use the grout colour dropdown (above) to view representations of your mosaic with other grout colours. For a price for your location/currency, or to choose delivery options, please add to your shopping basket where you can get live quotes with our new online system and place your order. Our site will consult an independent broker system to get the best live courier quotes it can, and recalculate your basket prices for your location including the actual delivery costs and options. For many major currencies, it will also show a likely cost to you in your currency, allowing for current exchange rates. In case you have any queries not handled by our new system, we have also retained our quote form: you can use the button below to ask for a quote.